Some people might say there’s something missing at our Thanksgiving table. They might say that the conspicuous absence of a large, help roasted bird means that it’s not Thanksgiving at all. But my family would disagree. I don’t remember the last time my mom roasted a whole turkey. They’re difficult to carve, easily dry out and everyone fights for the white meat. My mom tried a Turkey Roulade one year, and we haven’t looked back since. 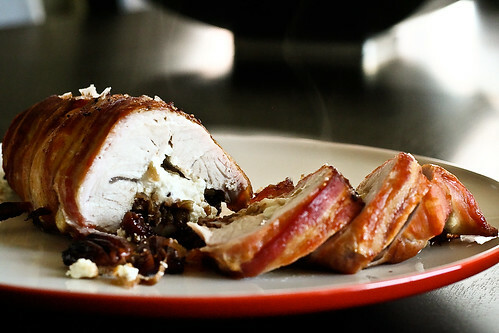 Usually, we make a prosciutto and sage-stuffed turkey breast, wrapped in peppered bacon and basted with pear jam. It’s absolutely delicious. The bacon and jam keep the turkey nice and juicy, and the pepper is a perfect contrast to the sweet jam. My mom’s been doing this turkey for years, and we decided to change it up a little this year. We picked our filling ingredients and I volunteered to make a test turkey. Instead of prosciutto and sage, I stuffed it with caramelized onions and figs, goat cheese, cranberries and chopped toasted pecans. I still wrapped it in bacon — how could I not wrap it in bacon? — but I did skip the pear jam and I couldn’t find peppered bacon. The new filling was a definite success. It was rich, tart and sweet without being overpowering. I had skipped the pear jam because I thought the filling would be too sweet, but the sweetness actually mellowed out while the turkey roasted and the bacon didn’t caramelize as well as I’d hoped, so the pear jam will be back on Thanksgiving day. I also missed the spicy kick from the peppered bacon to counteract the rich filling, so I’ll redouble my efforts to find before the big day. It’s not a traditional turkey, but it’s delicious, easy to slice, easy to serve. I already can’t wait to hit up the leftovers in my fridge! Caramelize the onions and figs. Place a skillet over medium heat. Once it’s hot, add the onions and shallots. Saute for 15 minutes, stirring occasionally, until the onions and shallots turn translucent. Add the figs and water (or stock) and continue to cook for another 15 minutes, until everything is a golden, caramelized color. Remove from heat. Line a rimmed cookie sheet with parchment paper or foil, then set aside. Now, lay your bacon out length-wise on your work surface. You want each piece to slightly overlap the piece before it. Place the butterflied turkey breast on top of the bacon, with the butterflied, split portion perpendicular to the bacon. You want the bacon to wrap around the turkey when you roll it up. Sprinkle the turkey with salt. Layer the caramelized onions and figs, goat cheese, cranberries and pecans on the turkey, making sure to spread the filling out in an even layer, or your turkey will be hard to roll. Using both hands, start rolling the turkey onto itself like a fruit roll-up, stuffing the filling back in if it escapes. Wrap your butcher’s twine around the turkey breast. Place the turkey on the prepared cookie sheet, seem side down, and spread the pear jam all over the bacon. Bake for 1 1/2 – 2 hours. It’s done when the bacon is brown and caramelized. Remove from oven and let cool for 10 minutes, then slice into 1 1/2 – inch rounds and place on your serving dish. Drizzle with any drippings and serve immediately. *Toast the pecans by spreading them out on a cookie sheet (whole) and placing in a 325° oven for 20 minutes. Let cool, then chop coarsely. Stuffed with caramelized figs, onions, and pecans? That sounds sublime. Of course, with my dad coming for Thanksgiving this year, I’d never hear the end of it if we didn’t have the whole bird. He’s a leg man, ya know? Have a happy one. Ha! Yeah…it’s not for everyone. BUT, I made the test version with turkey tenderloins, which is totally do-able for weeknights and weekends. Just cut the baking time in half (I used the same amount for 2 large turkey tenderloins). My husband & I cannot wait to try this out. I sounds fantastic. Have you tried brining the turkey breast ahead of time? Or, do you think it would be a bit overkill with all of the other flavors? This looks amazing. The original version sounds good, too. Would you be willing to share the recipe for that, too? k8 – Same recipe, just swap the caramelized onions and figs, goat cheese, pecans and cranberries with a few slices (probably 8 – 10 slices) of prosciutto and about 20 sage leaves. Lay the slices on the butterflied chicken, then add the sage leaves as evenly as you can. Drizzle with olive oil, then roll the turkey and bacon up, and baste with pear jam (same as recipe above). How does your bacon not burn for that duration in the oven at that temperature? If you cooked the bacon alone, it wouldn’t take nearly that long? bobo – I’m not sure why it doesn’t burn, but it doesn’t. My best guess is that the turkey gives off steam while it cooks, and that keeps the bacon from burning. It does get brown and crisp, but doesn’t burn. Any other options other than pear jam to baste with? Not a big jam fan here… Looks marvelous. Rachelle – Don’t worry! I’m sure your turkey will be delicious. I would check to make sure your turkey isn’t pre-brined. Some do come that way. Just check to see if it says “pre-basted” or something on the package. If you’re going to do the brining yourself, I’d recommend doing it Thanksgiving morning right when you wake up. Just put it in a big stockpot or big brine bag (most grocery stores will have them this time of year). You can also add herbs and lemon halves to the brine to give the turkey some extra flavor. Or you can just do salt and water. Check out Serious Eats for some good brining tips. Tim – The jam adds a sweetness and caramelizes the bacon really well. Doesn’t taste too much like jam when you’re done. You can also rub the bacon in brown sugar, but you’ll need to cover the turkey with foil for the first 45 min – hour or else the bacon will burn. Also, baste it every 20 – 30 minutes with the pan drippings to keep the bacon flavorful and to keep it from burning! Is the goat cheese a mild one like chevre or more like a feta? It’s coking right now in my oven! Was a lot of fun to make – I definitely didn’t think it was going to all fit in there, but it’s cooking right now. Looking forward to seeing the finished product and serving to my family for thanksgiving. Thanks for the recipe! hello! i randomly found your blog through tastespotting and used this recipe as inspiration for my own thanksgiving turkey! i wanted a more traditional flavor, so i stuffed the breast with my own classic stuffing (bread cubes, apples, celery, parsnips, onions, toasted pecans, seasonings) and lightly basted the bacon with homemade cranberry-blackberry sauce. it was absolutely AMAZING. everyone raved. i think i’ve found my new go-to thanksgiving turkey recipe! thank you! It was fantastic, a huge hit at our house. Thanks for the inspiration and the recipe! liana – MMM. Your version sounds delicious! This recipe was delicious to say the least..But I’m not going to lie, it wasn’t the easiest to roll the turkey breast. The largest the store had was 3lbs, and I’m glad it wasn’t any bigger like the recipe called for. I had the butcher butterfly it, but once all the bacon was laid out, the filling spread evenly across, it was probably close to two inches thick! Do you ever pound it out to make it thinner? Oh I also couldn’t find pear jam, but they had quince, which was a wonderful substitute! Chloe – did you use this URL for your RSS feed? Made two of these last year for Thanksgiving and just pulled it up from my recipe bookmarks to start thinking about this year. It turned out great with a few of our own tweaks. Our filling consisted of caramelized onions, pecans, and apples. We were a bit worried that they wouldn’t turn out since it was a Thanksgiving day experiment, but it was awesome!! Recipe looks great – can’t wait to try it this year. I’ve looked at other recipes which call for pounding out the butterflied turkey breast. Do you leave as is? Thanks! Hi Tori – If it looks too think to roll when you butterfly it, you can pound it down. If not, it’s not necessary. Sometimes I do, sometimes I don’t. Has anyone tried cooking this in advance and freezing it? Wow! This sounds awesome. I was just randomly looking for sites that will tell me about how to roast a butterflied turkey (I’ve never done it). We are changing our plans to make this version! Thank you! I’ve been looking for a turkey roulade recipe – checking out what’s out there. I really appreciate all the great info, Mel. My husband doesn’t eat beef or pork so I won’t be able to do the bacon wrapped around the turkey breast. Sometimes I substitute turkey bacon because it at least adds a smoky element to some dishes – but it certainly doesn’t add the fat – which I think is what you’re going for here. Just made this for a crowd of about 12– turned out fabulous! (And I don’t use the word fabulous lightly). I had to make a few substitutions due to availability in my area (dried apricots and raisins for the figs, apricot jam instead of pear, and instead of peppered bacon regular bacon with a truckload of freshly ground pepper rubbed on). I also had some pretty narrow turkey breasts so I pounded the daylights out of them to get some more surface area before rolling. Thanks for the recipe! I’ll definitely make this again. Thanks for posting this! I’m very excited about trying a roulade this Thanksgiving. However, my husband does not like figs. What fruit could I substitute instead? Dried plums, apricots, dates? If anyone has some advice here, I’d surely appreciate it! So, I made this for dinner today. It was AMAZING! I was pretty proud of myself since I am basically feral. Thank you for a great recipe. If I’m trying to cut down a bit of prep time, do you think I could make the stuffing the day before and refrigerate until ready to stuff/roll the turkey? Thoughts? I made this recipe with a few modifications (added apples to the stuffing, used Stilton instead of goat cheese) and it was DIVINE! The bacon kept the turkey nice and moist, the stuffing -mmmm… It was to die for! I also made the Rye Bread stuffing recipe. I didn’t have tart cherries, so I used regular dried cherries instead and a few dried cranberries. I know this changes the flavour profile considerably, but it was still a huge hit! I will definitely be making both of these recipes again, and again, and again! Have you ever made these roulades with individual turkey or chicken breast cutlets? Do you think it would work to do so and follow the same recipe except shorter cooking time? elizabeth – I’ve never made it with individual breasts, but I’m pretty sure it would work really well. You just might have extra stuffing and you’ll definitely want a shorter cooking time – probably around 30 minutes or so, but I would start checking it at 25 minutes. This is, by far, the absoulte best turkey receipe I have ever made!! Bravo! Only two substitutes: 1) I used dates instead of figs for the stuffing. The only reason I did this is because I left my shopping list at home and thought this is what the receipe called for. 2) I used apricot preserves instead of pear. I made this for Thanksgiving and my father and brother are traditionalist, and were quite sceptacle. My father RAVED about the turkey and my brother took some leftover home with him! Slam dunk! I recommend everyone try this! Thank you for the receipe!